Mullah Azizullah was born 1980 in Helmand Province. He is living in a Kandahar city safe house with 14 other former insurgents for almost eight months, Azizullah claimed the Afghan government had unexpectedly cut off their stipend for food over the weekend (20110612). 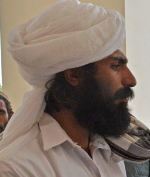 Azzizullah claims to have fought in Musa Qala against the British and U.S. marines in Marjah. He also claims to have waged his private war for nine years, ever since corrupt Afghan police came looking to confiscate weapons as part of a government demobilization program. The police searched his Musa Quala house, in a rough, little corner of Helmand province, and beat his family when they didn't co-operate. From that moment in 2002 he became a Taliban. Azizullah learned to how make crude bombs out of old Soviet munitions and eventually moved on to make homemade explosives with fertilizer. He rose quickly and came to command a cell that operated all over war-torn Helmand, adjacent to Kandahar. He was persuaded to give up by Gen. Abdul Raqiz, the notorious border police commander whose 400-string militia acted as a mobile strike force killing Taliban ahead of 2010 NATO sweep through Kandahar. Azizullahs statement could not be verfied by the Nationonal Directorate of Security (NDS) as they did not return phone calls.